Looking for a new baby panther chameleon for sale? If you are searching for the perfect new pet panther chameleon for sale from the best panther chameleon breeder, you have come to the right place! Most importantly, all of our pet chameleons for sale are 100% captive bred! Because CB Reptile offers all types of chameleon species for sale including the common veiled chameleon for sale as well as more rare locales of Panther Chameleons for sale. Panther chameleons for sale are one of the more docile of the common chameleon types, though you can get an occasional grumpy one. It is important to remember that pet chameleons like to be left alone. They are a great display animal that should not be handled on a daily basis. Some tips to remember when handling a chameleon are to approach the chameleon from the bottom. A hand coming from above can be taken as an attack. If you have a grumpy chameleon, first coax it onto a stick and then onto your hand or arm. With time, most chameleons come to associate their owner with food and will often come to the door in anticipation of feeding. Panther chams are one of the most colorful chameleon species available today. Also, native to Madagascar, they are able to turn a wide variety of colors depending on their locale or the area from which their line originated. If you are searching for the right chameleon breeder to find the most beautiful panther chameleons for sale, you have come to the right place. Secondly, our panther chameleons for sale include the option of buying a baby panther chameleon, a juvenile panther chameleon or adult panther chameleons for sale. It is true that panther chams are commonly available from reputable breeders and can usually be found at local reptile shops. Additionally, they can be purchased at reptile shows or through the Internet. Because panther chams for sale are fairly common, it imperative that you choose the right panther chameleon breeders. Interestingly, the Ambilobe panther cham is the most common locale. Secondly, others, such as Nosy Be, are becoming more widely available. Consider that panther chams are typically priced on their locale, their, size, and color. Lastly, male and female panther chams can vary in price. Chameleon cages are really set up better when they are left to have a bare bottom. The substrate will only complicate the cleaning of your chameleon’s cage and give insects a place to hide, setting up a biological setup is possible but not recommended. If you choose to have substrate, keep it simple with paper towels or newspaper. Humidity is provided when you water your plants and chameleon. We also have male panther chameleons for sale as well as female panther chameleon for sale from all panther chameleon locales including the most popular Ambilobe panther chameleon for sale, Ambanja panther chameleon, the Nosy Be panther chameleon and Nosy Faly Panther Chameleon. Our baby chameleons for sale are all 100% captive bred and come with our full health guarantee. A good chameleon diet is a varied diet! Normally, crickets are the main staple, but superworms, silkworms, hornworms, waxworms, roaches, stick bugs, etc., can all – and should all – be offered to your panther cham. Be sure to feed gut-loaded insects. It is also necessary to dust your insects with vitamin powders. You can do this in a number of ways. I recommend doing calcium three times a week, calcium with D3 once a week, a small dusting of Miner-All one time a week and Herptavite one time every other week. Male panther chams typically have a body length of 12 to 18 inches while females are slightly smaller at 10 to 14 inches. A healthy male panther cham will average between 140 and 180 grams in weight, and a healthy female panther cham will weigh around 60 to 100 grams. Panther chams can have a varied lifespan depending on the care they are given. Under good conditions, your female panther should live 3-6 years and males 5-10 years. Panthers need a high humidity level; it’s best to aim for between 60 and 85 percent. This can be accomplished by misting the plants regularly, and a drip or misting system is also recommended. Chameleons rarely drink from a water bowl, but they will lap up droplets of water off plants, so the misting/drip system also serves as a water source. Position a drip system so the water droplets cascade over the plants in the enclosure. Invest in a hygrometer to measure humidity. We highly recommend the Mist King for any pet chameleon for sale. Because water is one of the most important things to consider when keeping a panther cham. Also, panthers love to drink and need to every day. Here at TT, we suggest running a drip system most of the day at least twice a week. Also, will allow the panther chams to drink nice full drops of water whenever it likes. Secondly, it will also keep your plants watered. Lastly, misting the chameleon 4-8 times a day is preferred. By doing this, it will keep the humidity in the required 60 to 70 percent range. Lastly, misting properly will also allow the animal a chance to drink ample supply of water. Looking for a pet chameleon for sale? panther chameleons for sale are available online at CBReptile.com! Offering everything from baby Ambilobe chameleon, as well as baby blue ambanja panther cham for sale, baby nosey be panther chame nosey faly chameleon, as well as sambava chameleons. 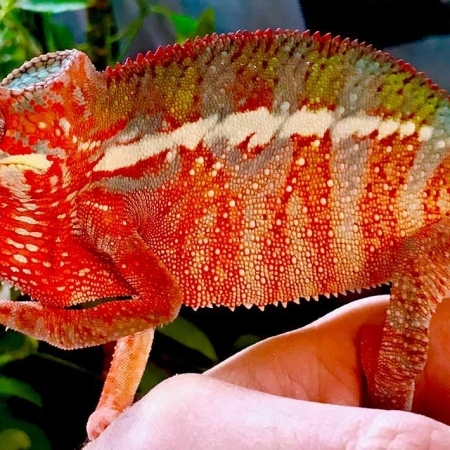 If you’re looking for adult panther chameleon for sale, check out their adult Ambilobe chameleons, ambanja Nosey Be chameleon Nosey Faly panther cham as well as samabava chameleons for sale. Ambilobe Panther Chameleon are probably the most popular, with Ambanja panther chameleon being 2nd. Nosey Be Chameleon is most likely third and Nosey Faly Panther chameleon followed by Sambava panther chameleon are the rarer of the bunch. Calcium and vitamin A deficiencies are common among chameleons including the panther. This condition is usually the result of a poor diet. And like other chameleon breeds, panthers are prone to mouth rot, or stomatitis, an infection around the mouth that shows redness and excess saliva or drooling. Perhaps the most serious illness for captive chameleons is metabolic bone disease. This condition, which can be fatal if not treated in a timely fashion, causes a chameleon’s bones to become weak and brittle. A chameleon with this disease will appear lethargic and may lose their appetite. As with any condition where your pet seems ill or stressed, consult a veterinarian who specializes in reptiles.